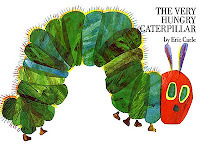 I know you love The Very Hungry Caterpillar. Who doesn't? But can you name all 15 foods he eats in 5 minutes? I have to admit that I could only name 12. Banned Books Week is right around the corner (September 26-October 3, 2009), so check out this Google map of 2008 book challenges (I think they're from 2008...) Link via bookshelves of doom. Have you done an awesome outreach program to an underserved community? Good for you! You might want to apply for the "Light the Way: Library Outreach to the Underserved" grant. Link via ALSC blog. There's talk all over the Kidlitosphere about advertising on blogs, getting paid for product promotion. MotherReader has a great roundup. All bloggers should read it and familiarize yourself with the discussions going on. Speaking of Pam, she's also got a great post at Booklights on early literacy games. Fun, easy activities parents can do at home to develop those early literacy skills! ETA (11:54pm - why am I still awake? ): OH. And I know everyone's excited about KidLitCon (I've registered, have you??? ), but I am also excited about Anderson's Bookshop's YA Lit Conference! I booked our hotel room tonight, so you know I'll be there. Fun quiz! I got 13... would have gotten 14 if I'd remembered the flavor of certain desserts. Wow, that book bans Google map is awesome. Although, I'm pretty ashamed that one was in my own backyard...doh!